Dream Team: Sam Jones, Mike Mills, Amy Mills, Mitchell Davis, Brad Orrison, Wayne Mueller, John Delpha, Aric Nissen, and Barry Sorkin. Not pictured: Kat Kinsman. 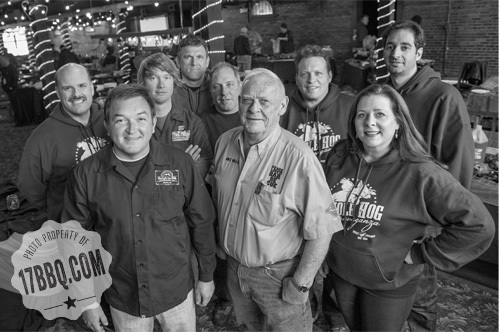 The BBQ MBA is part of the Whole Hog Extravaganza/Brisket Bonanza event held each January. While the hogs and brisket are cooking, we gather to hear wisdom, advice, and cautionary tales from the pitmasters and marketing/media masterminds. I love feeling of potential that greets me every January as I start a fresh New Year. The exercise of planning and putting ideas and concrete goals in my calendar is immensely satisfying. For the past two years, much of my inspiration has come from the BBQ MBA portion of the Whole Hog Extravaganza/Brisket Bonanza. The ideas and information we share helps me prioritize specific projects and provide a burst of energy in my creative thinking. 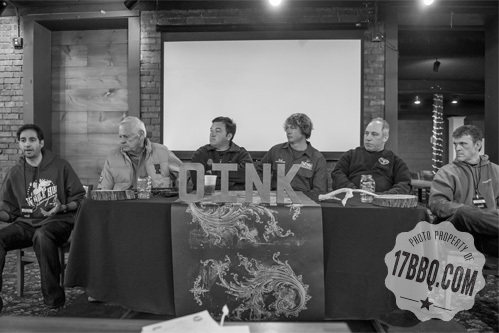 The pitmasters talked about restaurant branding, how television affected their businesses, and their own personal barbecue journeys. The incomparable Kat Kinsman, editor of CNN’s eatocracy.com took the stage with equally eloquent Mitchell Davis, EVP of the James Beard Foundation and me and we discussed social media dos and don’ts and how to use it to develop relationships, as well as PR strategies for winning media attention. Mitchell also gave a rousing talk aptly titled, “Barbecue in Context: from Pits to Pouilly Fuissé” – a perfectly on-point discussion about barbecue’s place in American cuisine. Brilliant marketing and branding mastermind Aric Nissen spoke about branding and menu engineering. 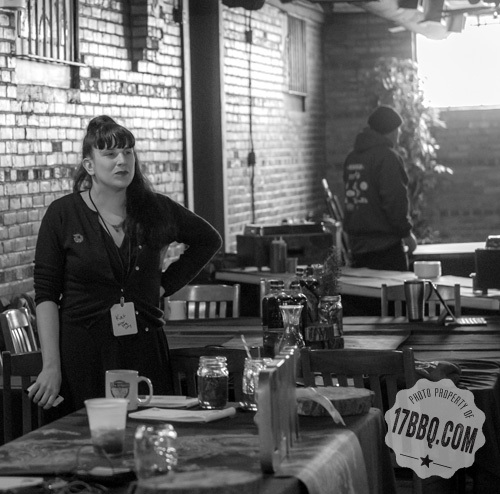 I shared ideas and insight about the real work behind building a successful barbecue restaurant and brand. Did you attend this year’s event? I’d love to hear your favorite takeaway in the comments below. Read about the Brisket Bonanza portion of this event here. Read more about OnCue events and the 2013 – early 2014 schedule here. Follow our speakers on twitter here: Amy, Kat, Mitchell, Aric, Wayne, Barry, Brad, Sam, and John. 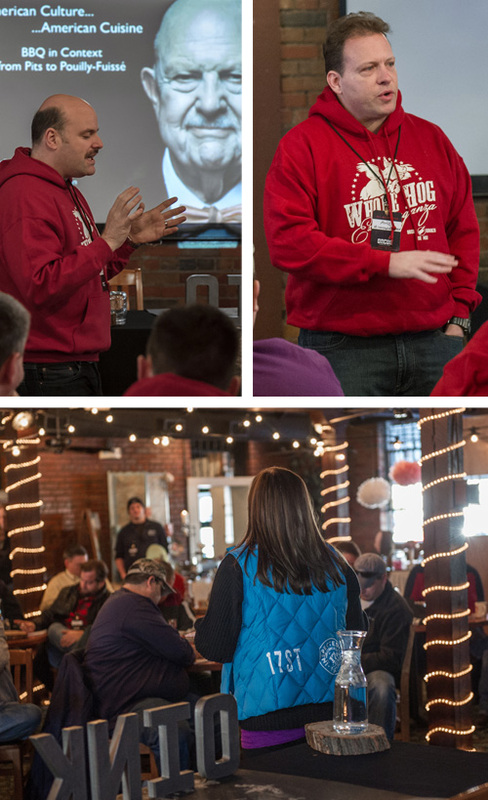 Make 2014 your best year ever and join us at the next Whole Hog Extravaganza/Brisket Bonanza/BBQ MBA which will be held January 19-21, 2014. All photos © Ken Goodman Photography. View the entire gallery here.